Hello. Let me introduce ourselves. In 2003 I gave birth to a miracle child. Chance Allan came into the world in respiratory distress and spent the next 30 days in the NICU fighting for his life. I was told he most likely wouldn’t live and to prepare myself. But Chance beat the odds. In October 2003 I finally brought my little bundle of joy home. And was immediately scared to death realizing I didn’t know how to care for him. Chance is completely hormone deficient. He takes replacement hormones for his pituitary hormones. Some in pill form, others are daily injections. 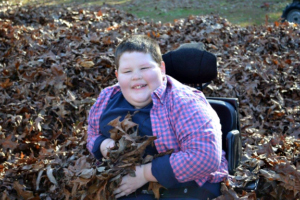 He has several different neurological impairments, including Agenesis of the Corpus Callosum, Bilateral Periventricular Nodular Heterotopia, a cyst in the posterior fossa region that compressed his cerebellum. It was shunted in 2006 due to an increase in size. His optic nerves are smaller than normal leading to Optic Nerve Hypoplasia. He was blind until he was 6 months old; however his vision has improved over time. He has cerebral palsy on his right side, sickle cell trait, thirteen ribs……..well you get the point. He’s an amazing, miracle child who should have never lived but did. He is my inspiration for everything I do in life and now my mission is to spread the word of Ultimate Workout And Recovery because of the hope it has given us for him. 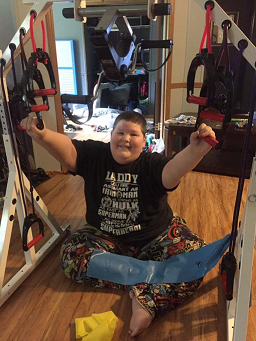 In 2011 Chance was diagnosed with ROHHAD, Rapid Onset Obesity with hypothalamic dysregulation, hypoventilation and autonomic dysregulation. It is very rare with only approximately 100 cases worldwide. Affecting the autonomic nervous system there is no cure and we needed more research for better treatment options and to find a cure. When he was 2 ½ years old, Chance began gaining weight and despite dietary efforts and therapy and other treatments, he continued gaining. Today Chance is 12 years old, he is immobile so exercise, while not impossible, is limited. He weighs 228 lbs and is 5’6” tall with a BMI of 36.8. I began researching, asking questions of doctors, nutritionists and essentially anyone who would listen, to get my son help. I even consulted with other parents in the same situation and the consensus was that there was no help available. Most of these children have limited mobility so a typical exercise regime is out of the question. However, movement is necessary to get the metabolism going so it becomes a vicious cycle. My cousin, herself in a wheelchair with limited mobility however, just happened to get exercise equipment one day. And suddenly a light bulb went off! It was helping her, so why not Chance? My mission of acquiring my son this piece of exercise equipment was finally, after several attempts, rewarded. I was received a grant and Variety Children’s Foundation based out of Los Angeles which also has many branches throughout the USA supporting special needs families acquiring equipment like this purchased the Spider Edition of Ultimate Workout And Recovery for Chance. I CRIED the day it was delivered and we set it up. There was now HOPE for my son to gain movement in his daily life. There was hope for muscle strength, weight loss or at least maintenance. Hope for improved breathing ability. After this, all I could think about was getting the word out to other parents / personal trainers / caregivers / therapists and moms everywhere who deal with a disabled loved one either adult OR child so I started posting everywhere I could think of, telling them to check it out, to talk to their PT’s and doctors about it, to find funding to get it for them! Our kids could move again and help their bodies fight this battle that ROHHAD has given them. Will it cure them? No, but it will prolong their lives; it will give them better quality of life while they are with us. This passage is the foundation on which we build our lives as special needs parents. Hope…..it’s all we have in our lives. And this piece of equipment gives us one more ounce of hope. I will shout from the mountain tops about Ultimate Workout And Recovery to help one more person gain that ounce of hope. Every reason in the world why the MILLIONS disabled child or adult alike should know about this life saver and game changer. God bless us all.